I’m not really one to jump into all these themed sewalong events that seem to regularly crop up in our online sewing community. No offence at all meant to those who do, I love to watch most of them, but just tend to be a bit more wilful/indecisive and find it hard to stick to a theme! But one that did immediately appeal to me is Slow Fashion October, spearheaded by Fringe Association. It’s ostensibly the knitting community’s riposte to Me-made May, but it’s an equal-hobby opportunities event with sewists getting on board too. In fact the remit is even wider than creating a handmade wardrobe, but designed to celebrate sustainable fashion in all its forms: secondhand, upcycled, mended, handed down, and so on. I probably don’t need to explain why a month of slow fashion appeals to me. 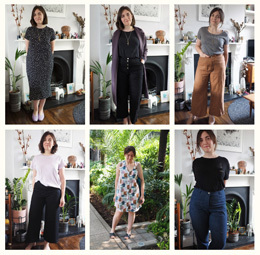 My main reason for sewing is to reduce my negative footprint on the garment industry and to build a small and perfectly formed everyday-wearable handmade wardrobe. To make that happen it’s increasingly important to me to take the time to make sure that what I sew is what I really need, as well as every garment being well made and designed for longevity. Lofty ambitions that I definitely have not achieved yet, but a whole month dedicated to more mindful sewing is a great thing to sign up for. • A sort of shrunken – but not fitted – shape. I realised I really hate looseness in coats and always size down in RTW ones. • Not too warm! Weird one, but as I walk and cycle a lot and don’t really feel the cold that much, I don’t need much more than a slightly snuggly layer to keep wind chill out. • Fun to sew and a bit ‘special’ – if it’s going to be slow, I need some return on investment. 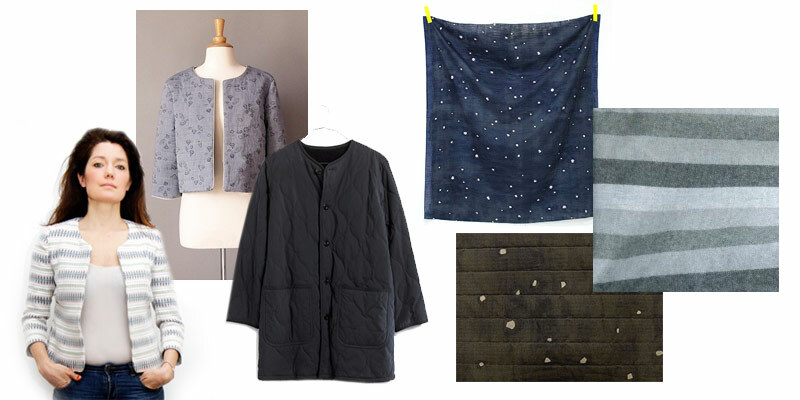 I’ve bought the Republique Du Chiffon Bernadette pattern (available in print in English now, yippee), some super dreamy Nani Iro double gauze, and I think I’ll use some brushed cotton already in my stash for the reverse side. The pattern needs lengthening and toile-ing but is actually a really straightforward sew – which leaves some brain-space to make more interesting and intricate decisions for the fabric and finishing details. My original plan (and the original impetus for my fabric choice) was to buy some pre-quilted Nani Iro double gauze, but it’s frustratingly hard to get hold of outside Japan. I made an Etsy order, but the factory went out of stock so it got cancelled. Right now I am doing some little swatch experiments to try and manually recreate the effect without adding too much bulk or warmth. This left-hand swatch uses a bamboo-cotton quilt batting in between my gauze and flannel layers. As you can imagine, it feels like an absolute cloud-kitten-lovefest dream… but I’m slightly worried it’ll get too warm in there and well, just look and feel like I’m wearing a sleeved quilt. I went for a meander in Soho yesterday and found this thinner and less dense fusible batting, sewn up on the right. I think this may be the one I go with, because fusing the batting to the double gauze gives it a little extra structure and strength too. I’m also pre-puzzling out construction details in my head. I’ll likely rough-cut the pieces needed (only 3 in Bernadette’s case) then fuse and quilt them before cutting the pattern, in case of shrinkage from the quilting. Then I’ll need to bind the raw edges instead of bagging it, and I might as well go the whole slow-fashion hog and hand-sew the binding. Which made me wonder if I could make it 100% reversible for maximum satisfaction and versatility. YES!… which then made me question what sort of seam finish can take the bulk of quilting yet look acceptable from either side. Trim out the fusing from the seam allowance and flat-fell perhaps? And what about those all-important pockets? In conclusion so far: this slow sewing thing is sort of brain-tiring, but a lot of fun. It remains to be seen if I’ll actually finish my jacket before the end of the month, but I suppose now more than ever it’s really not a race. Anyone else sedately sewing along with #slowfashionOctober?